"Take me!" the buzzard longingly whispered in the alligator’s ear. Is it the pinnacle of nerdiness or the zenith of dweebery? Whichever it may be, I was it last night. On Thursday, Septermber 9th, from 7 until 10 p.m. I sat alone in my room and drew a dragon. I began by sketching out my beastly friend very roughly using a Photoshop airbrush and my Wacom tablet. 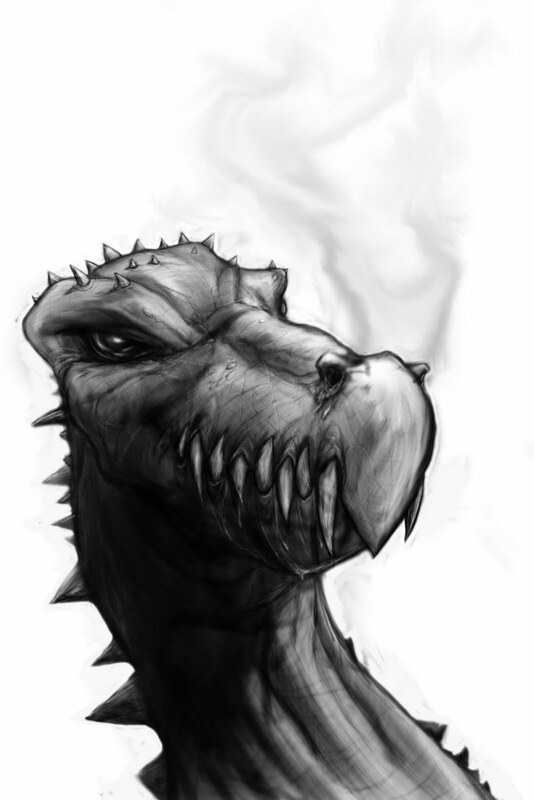 After my evil eyed Eragon was generally laid out, I switched to the dodge and burn tools. This allowed me to focus solely on the lights and darks of this malevolently mouthed menace. I have found that using the dodge and burn tools can sometimes create a shiny, almost slimy affect. Perfect for creeping creepers and dripping drool. Once I was satisfied, I set my lascivious lizard layer into multiply mode. This let the white parts of my gray-scale gargoyle become transparent, essentially making my dastardly drawing into a 21ist century coloring book page. I began digitally painting with absolute freedom, knowing that my black and white rendering was solid and would hold the picture together despite any ham-handed coloring. One thing to watch out for when working in multiply mode, is that your highlights will dull out as you fill in those glowing whites with color. To counteract this problem, I simply added another layer on top called highlights, and airbrushed those shiny moments back into existence. This was especially important in the eye, teeth, and all that glorious drool. 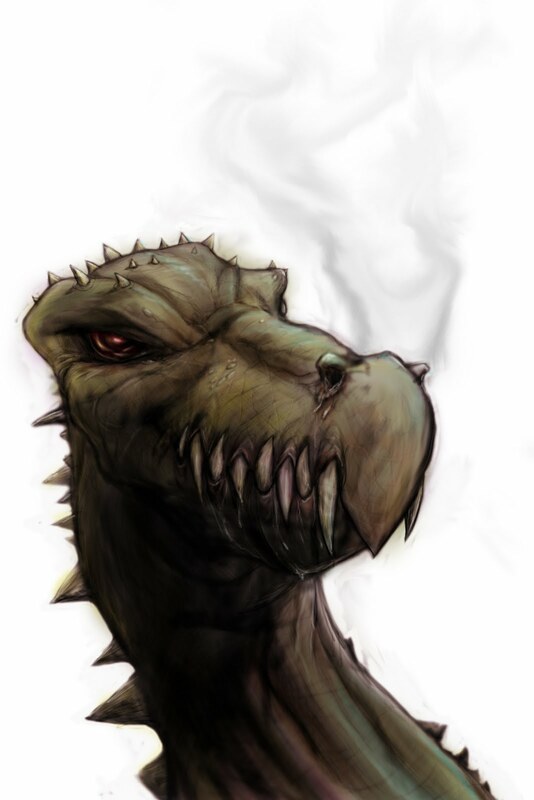 *Doesn’t my dragon look like the long lost child of a buzzard and an alligator? That must have been quite the romance. 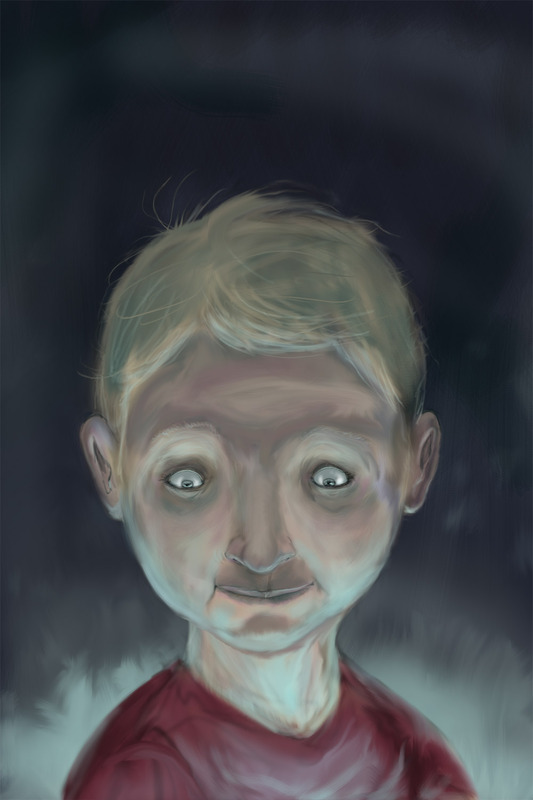 I worked up a quick digital painting of a kid in some sort of mysterious glow. No real concept. I was just playing with the blue light from below. All in all, this isn’t terrible for an experiment. I like some of the forms (particularly around the brows) and some of the lighting effects. This could serve as a nice preliminary sketch that could be taken much further with a little pre-painting research. As it so often seems to do, life intercedes (or is it interferes?). I have been, and will continue to be incredibly busy for the foreseeable future. While I have to acknowledge that my art output and ambitions will be slowing down due to some important obligations, I will not be giving in or up. I will continue to post on this blog while working my way toward the life I have always wanted and have been working for since I could hold a pencil. There are no roadblocks insurmountable, only detours. That said, I suspect that my posts will be briefer and my artwork more of the sketch variety. My hope is that the new “quick and dirty” Made of Lines will prove to be even more fruitful and satisfying moving forward. This weekend I worked up this quick watercolor sketch. 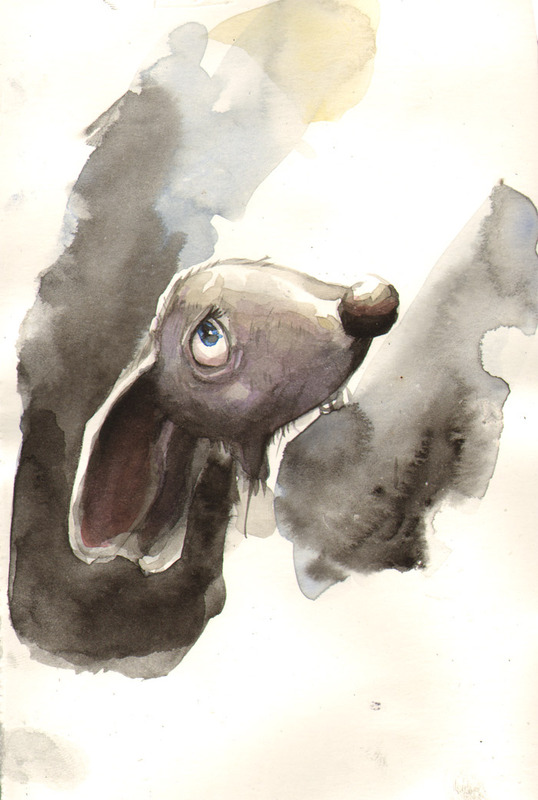 Clearly I was thinking of my Despereaux digital painting. I have been looking at this sketch all weekend, reminded of the wonderful vitality of the watercolor medium, and its storytelling potential.